Southwest Airlines mechanics formed an informational picket line along Mockingbird Lane at the entrance of Love Field. The carrier's headquarters is nearby, and Southwest dominates traffic at the Dallas airport. It’s been a bumpy week for Dallas based southwest Airlines. This week, a computer outage took down its website, forcing 1,300 flight cancellations, and stranding passengers and crews. Then, despite a record second quarter profit, its stock price fell. 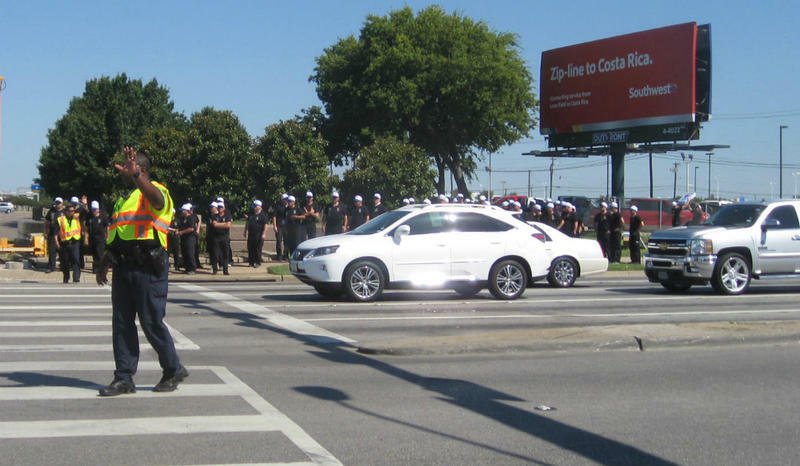 Today, hundreds of union members picketed at Love Field over stalled contract talks. As a Southwest 737 flew overhead near Dallas Love Field, union mechanics marched this morning to vent their frustration. They’ve have been working now four years without a contract. “All the contracts now have degraded to the point that they’re under federal mediation,” said Louie Key, national director for the Aircraft Mechanics Fraternal Association - AMFA - the union for Southwest mechanics. Yesterday, Southwest Airlines reported a record 2nd quarter profit of $820 million. Key says other carriers have given employees raises after profitable quarters. Not Southwest. In addition to pay, Key is also worried about job protection. As for the drop in Southwest’s stock - more than 10% over just days -the company said it doesn’t comment on stock prices.